It was a stunning performance by the teams from Bethany Lutheran Primary School, Leichhardt State School, Kruger State School and Karalee State School at the Ipswich Story Sports Cup final. 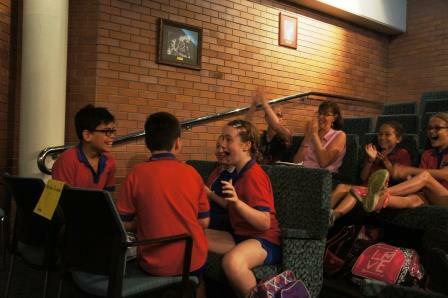 Karalee won the finals narrowly beating Bethany Lutheran Primary School. All teams performed well with some outstanding dramatical presentations of team writing by the captains of the teams. The audience particpated by answering questions about titles of books. See pictures of teh finals in the picture gallery.